DeMarsh’s first teaching job was in a tiny district up north in 1981. Not only was he the sole music teacher in the entire district, he was the fifth music teacher hired in five years. “I’d sent out 45 letters and only got one interview and they offered me the job, so I figured I better take it,” said DeMarsh, recalling that awful year teaching high school band, junior high band, sixth grade band and general music grades 1-6. After he turned in his notice, DeMarsh began a seven-year adventure that took many directions before leading back to the classroom. Deciding to switch from music education to performance—which had been his original plan leaving Seaholm High School in Birmingham—DeMarsh returned to the University of Michigan as a graduate student in tuba performance. Then came five busy years performing in three brass quintets as well as the Flint, Warren and Lansing symphonies, while holding down one part-time job after another, including newspaper deliverer, custodian, courier, taxi driver, and U-M projectionist. Eventually, he realized that Ann Arbor was a community that supported the arts, and that maybe teaching here wouldn’t be so bad. It was a hunch confirmed when he started subbing. With a wife and baby on the way, DeMarsh needed a steady income, and was relieved when part-time teaching jobs slowly but finally led to a full-time job as the Tappan Orchestra Director in 1990. 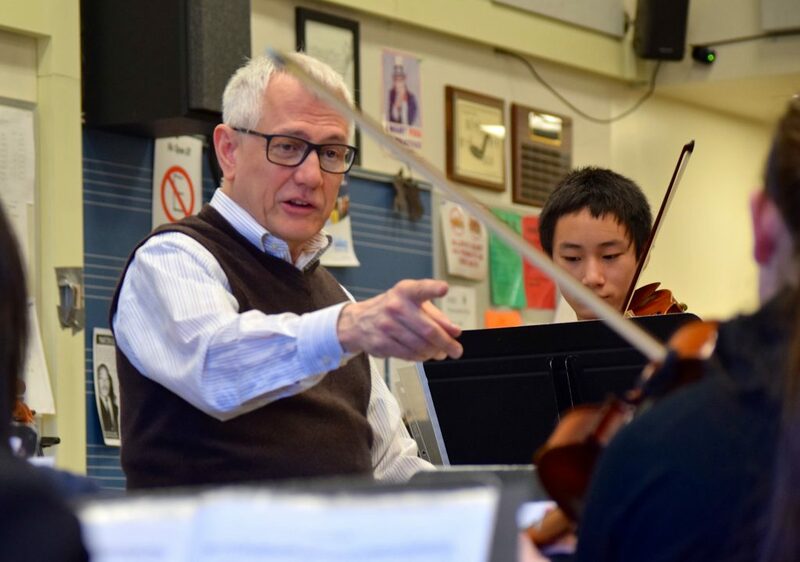 In June, DeMarsh will retire as the school’s acclaimed orchestra director who has time after time led his students to honors for musical excellence. His departure is a loss for the students entering Tappan next year, says eighth grader cellist Natalie Chapel, who has studied under DeMarsh for three years. DeMarsh, who has a strong preference for teaching orchestra over band because of the type of music performed as well as the simplicity of teaching strings versus a larger array of instruments, also teaches 6th grade Exploratory Music and 8th grade Music Technology, which is composition using Garage Band. Eastern Michigan University student Vanessa Kestner, who is DeMarsh’s student teacher this semester, says DeMarsh is clearly there for the kids. Pioneer High School Band Director David Leach says DeMarsh is one of the reasons AAPS enjoys the reputation as the flagship K-12 music department in the country. 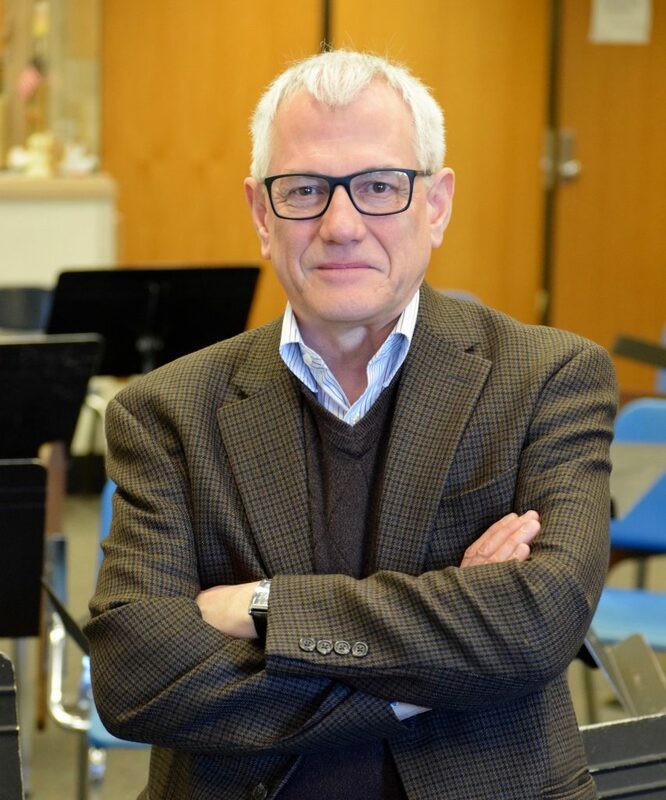 As president of the Michigan School Band and Orchestra Association, District 12, Leach was charged several years ago with filling the vice president position—the most time-consuming, detail-oriented job of all. He chose Joe DeMarsh, who held the position for three years. Leach says the joke is that DeMarsh is so OCD, he would put the letters in alphabetical order to make it CDO. DeMarsh is also, says Leach, an outstanding director, musician, and friend. “Every great tuba/baritone player I’ve ever had at Pioneer has been in Joe’s studio,” said Leach. While some believe middle school is the toughest age to teach, DeMarsh enjoys seeing the tremendous musical, social and physical growth that occurs between fall of sixth grade and spring of eighth. “And that’s been our privilege to guide them through that,” says DeMarsh, sitting in his office lined with thank you notes from grateful students over the years. Getting the kids ready for a concert has been the most fun part of the job. Two-thirds of Tappan’s 772 students are enrolled in at least one band, orchestra, or choir, and about 22 percent of all Tappan students are enrolled in orchestra. Tappan students consistently receive excellent ratings at band and orchestra and solo & ensemble festivals. 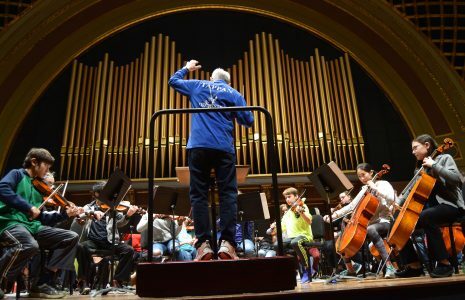 DeMarsh and students rehearse recently at Hill Auditorium. In January, Tappan’s 8th Grade Concert Orchestra was chosen after a rigorous application process to perform at the 12th Annual Michigan Music Conference in Grand Rapids. “That was the biggest highlight of my teaching career, to receive that recognition from a state-wide organization for an exemplary ensemble,” says DeMarsh, who was named the Michigan School Band and Orchestra Association District 12 Orchestra Director of the Year for 2015 for excellence in the classroom and on the concert stage. In 2014, DeMarsh was asked to become vice president for the MSBOA District 12 Solo & Ensemble Festival, the largest student music event in Michigan. Though he knows he’ll miss the kids, there’s no risk of a retired Joe DeMarsh becoming bored. As a member of several professional ensembles, including the Flint Symphony Orchestra, Toledo Symphony Concert Band, Today’s Brass Quintet, the FSO Brass and the Dodworth Saxhorn Band, he loves nothing better than to get together with his friends to create beautiful music for others to enjoy. DeMarsh and his wife of 31 years, fellow musician Nora Schankin, have two children, Helen, 26, and Nicholas, 24. Helen is a graduate student at Johns Hopkins University, and because her classes are online, she’s able to live in Ann Arbor and work part-time at the University of Michigan. Nicholas is the kitchen manager of NeoPapalis in downtown Ann Arbor. He’ll continue giving tuba lessons in the living room of his northwest Ann Arbor home, where his wife gives bassoon lessons in her basement studio. Retiring with 30.44 years spread over 36 years, DeMarsh is convinced the time is right to leave public education. While many say DeMarsh will be hard to replace, he knows the school will end up with a top-notch director. Last year 38 people applied for the position when Tappan Band Director Fred Smith retired. AAPS Fine Arts Coordinator Robin Bailey says DeMarsh will be greatly missed. Congrats, Joe, on a wonderful career We’re all so very proud of you! Wonderful tribute to a great teacher. And he will NOT be easy to replace! Congratulations on a job well done! I admire you so much. Mr. DeMarsh, you will be sorely missed. Your enthusiasm for the students and teaching them to appreciate and love music is contagious. Congratulations on a wonderful career and best wishes on your new one! Thank you for this wonderful tribute to Joe DeMarsh. Joe DeMarsh is a treasure among many wonderful teachers at Tappan. My heart burst with pride to see and hear the incredible performances by our students under his instruction. It was an honor to teach with him! Congratulations, Joe! You are going to love it out here! Joe DeMarsh has had an incredible work ethic focused on helping students achieve excellence in performance and the enjoyment of music. He helped many students succeed in orchestra who did not have the means without his support and encouragement. Joe worked in partnership with his colleagues to leverage success for thousands of middle school students. congratulations Joe. I know you will be missed. I’ll miss seeing you up at Interlochen with the Ann Arbor kids. We had to move toOkemos in 1978 because of Paul’s work, but we still miss Ann Arbor. I’ll have to share some stories with you in Symphony this coming week.